First of all, on Friday Sarah and I were going to meet Aaron and Lamia at Tim Horton's. Sarah and I got to Tim Horton's and chose a seat, but we got a call from Aaron saying that they might be a few minutes late. So, because I was having such a hectic day, I asked Sarah if she would mind picking up my cards at TPH (The Printing House), and she said, "No Problem!" I sat there on my own at the table, minding my own business. Suddenly this woman came and sat down beside me. I was surprised and annoyed, but I thought maybe she'll just leave in a minute. She did not. Instead she took out two pills, popped them in her mouth, and took a sip of her coffee. The woman did not speak to me, nor did she even acknowledge my existence. This started to make me feel uncomfortable. I thought about going after Sarah but then I thought No way, this is my table! Why should I have to leave? Then, what really made me mad, the woman began talking to another woman who was sitting behind me. They were discussing between themselves whether I was ok or not. Did I need help or should they call someone? Finally I exploded! I got the attention of the woman sitting beside me and pointed on my board to: Get Away From Me! Right about then, Sarah came back to this melee and I told her what had happened. The woman was saying, " I was only trying to help, I am from March of Dimes." Maybe I roared at that comment - I can't remember - but I was infuriated! I know so many people who have terrible attendants from March of Dimes. To say that she was from March of Dimes and seem to actually seem to be proud of this fact - that made my blood boil! Not to mention that she sat with me and actively humiliating me by talking about me to another person and yet not trying to talk directly to me at all. This is not acceptable behaviour for anyone, but especially for someone who works for an organization like March of Dimes which is supposed to be helping people with disabilities lead good, productive lives. March of Dimes workers should know better! The woman finally left, and I calmed down. 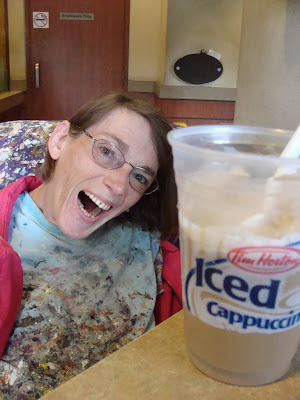 Then Sarah went up to get an Iced Capp to soothe my ravaged soul, and another woman came and sat down beside me. This time, however, it was somebody who knew me. She told me her news, I told her mine. It was a pleasant experience. I felt respected, included, and part of the great weave of society. Well, then on Saturday I had a fantastic day! However, once again I was faced with this polar opposite comparison between people. Let me tell you about it. I sold two smaller paintings. Fantastic! Fantastic! Fantastic! I met a journalist from the Chicago Sun-Times. He said he was going to do a story on the St. Lawrence Market and he might do a feature on me - how exciting! Then this guy from Ottawa came over to see my art and bought some cards. He told me he was an architect, and I jokingly suggested: Why don't you commission me to do paintings for your building? He thought that was a great idea! He said he might commission me to do several smaller paintings for one of his new buildings. I was so happy! 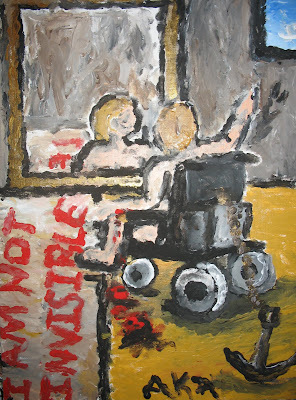 One of the people from Indiana was curious about my painting "Feelings of Invisibility," asking if I actually feel invisible. I explained to him that yes, sometimes society makes me feel as if I am invisible. It was around this time when two burly cops came and started asking my friend and employee Laura questions about a man who was murdered in the neighbourhood. I sat right beside Laura while all this was going on and neither one asked me anything or even looked at me. That's terrible! What if I had some important information? I turned to the guy from Indiana and said "See what I mean?" Oh well, some people get it and some people don't. I am just getting this. My condition started later in life and now I'm using communication aid and in wheelchair, people talk over me and like I'm child. I thought was just cos I'm deaf too and they didn't relaise I could lip-read them, but must be worse if you can hear people clearly talking about around you and not including you in the conversation.